(personally, I plan to use GW crypt ghouls "coated" with sand). Crest Riders & Coral Hunters are Games Workshop Lizardmen skinks. Interceptors and Oceanic Trident Guard are Games Workshop Lizardmen Saurus and Temple Guard. 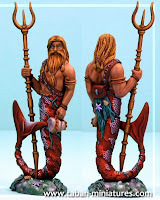 (Games Workshop Ltd miniature images are copyrighted ©. All rights reserved. Used without permission).